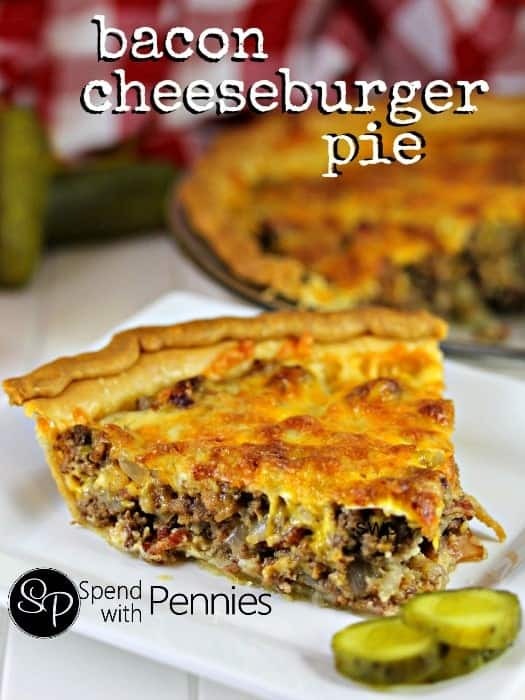 Cheeseburger Pie is an easy recipe that my whole family loves! 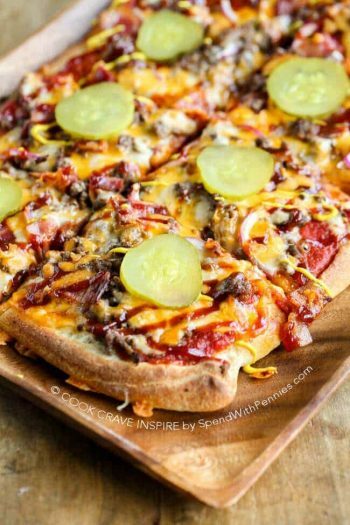 Lean ground beef and onions are combined with our favorite bacon cheeseburger toppings and spread into a flaky crust. I add my favorite cheesy topping and bake until golden. The results are an easy pie that is reminiscent of your favorite summer bbq meal! When summer arrives we’re always firing up the grill to make our favorite Jalapeño Cheddar Burgers serving them up with big bowls of Dill Pickle Pasta Salad! Truly fewer things better than a great hamburger… except a bacon cheeseburger! 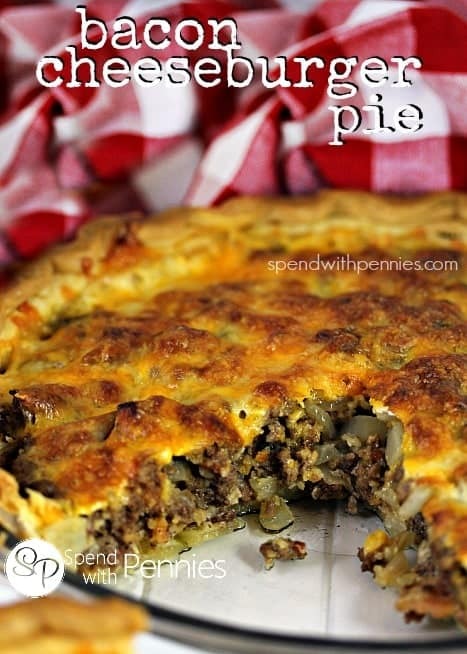 This easy Cheeseburger Pie combines those same great flavors in a simple pie recipe. 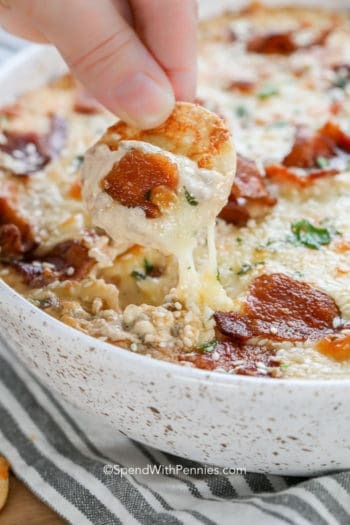 Combining our fave flavors in an easy to make weeknight recipe is the best… loads of bacon, gooey cheese and lean beef packed into one casserole that everyone will rave about! I like to keep this simple and quick so I pour the filling for this cheeseburger pie into a store bought pie crust (not deep dish). If you have a homemade pie crust recipe you love, you can definitely use it in this recipe or get creative and make a crust with crescent rolls or even a Cheeseburger pie with a bisquick crust! If you’re looking to keep this lower in carbs, you can skip the crust altogether… honestly this recipe is so versatile the options are endless! I use lean ground beef in this recipe but you can certainly sub it for ground chicken or turkey if you prefer. Once baked and bubbly, I let this hamburger pie cool for about 10 minutes and slice and serve. I sometimes put out a fun plate of toppings for everyone to add to their serving… chopped dill pickles, sliced red onion and diced tomatoes to name a few. We serve this with some Crispy Oven Fries and veggies and Ranch Dressing Dip for the perfect meal. 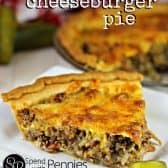 This cheeseburger pie recipe uses store bought pie crust (not deep dish) to make it super simple and quick. If you have a pie crust recipe you love, you can definitely use it in this recipe! Brown ground beef, onion and bacon until no pink remains. Drain well. Remove from heat and stir in bread crumbs, mustard, barbecue sauce, ketchup, Worcestershire and pepper. Place mixture in prepared pie crust. In a small bowl, combine cheese, milk and egg. Spread over meat mixture. Cover the edges of the pie crust with foil or a pie shield to prevent over browning. Bake 15 minutes, remove foil and bake an additional 15 minutes. If you’re looking for more cheeseburger-y goodness here are a few more recipes I KNOW you’re going to love! 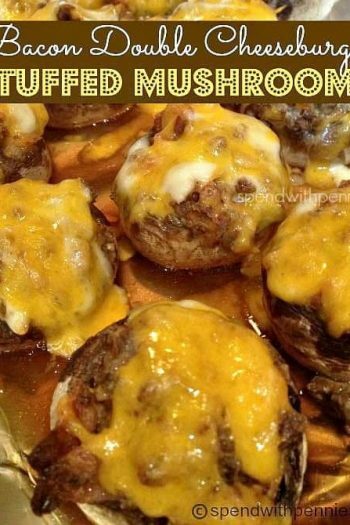 Bacon Double Cheeseburger Stuffed Mushrooms: Snacking just got a whole lot better! Cheesy, beefy and delicious, these stuffed mushrooms are the perfect party food! Cheeseburger Bombs Baked Bean Skillet: You NEED to try this recipe… Tender rolls stuffed with gooey cheddar cheese & tender meatballs, baked around barbecue baked beans. 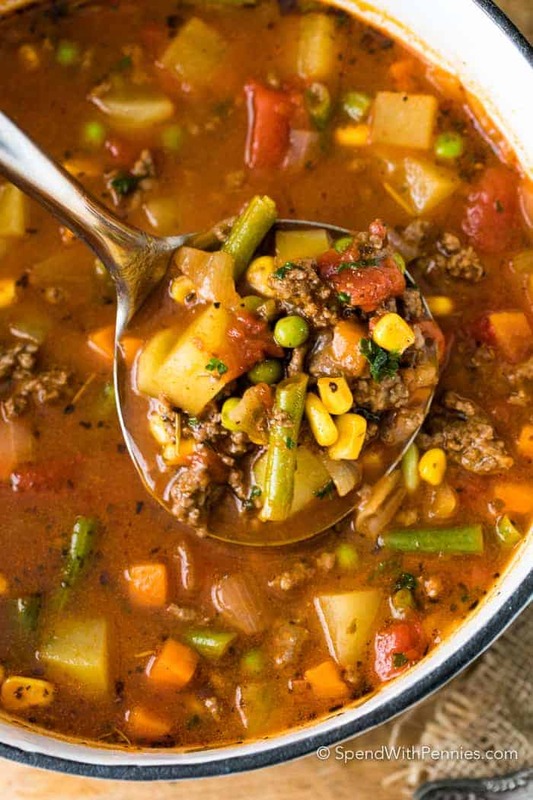 Bacon Cheeseburger Soup: Your fave cheeseburger flavors in a cheesy slurpable soup. Serve it with garlic toast for dipping! Cheeseburger Skillet Tortellini: This is some serious deliciousness packed into one skillet! Loads of meat, veggies, and ooey gooey cheese. 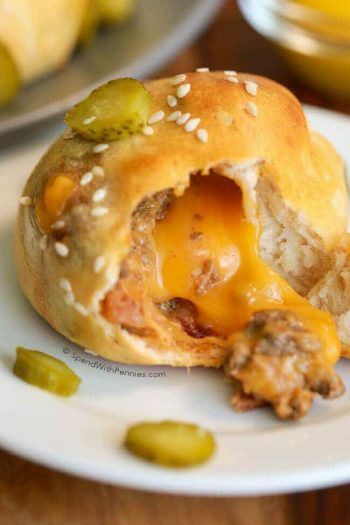 Bacon Cheeseburger Bombs: A warm crispy sesame crust loaded up with gooey cheese, seasoned ground beef, onions, bacon and all the fixin’s packed into one neat tidy little bundle! Bacon Cheeseburger Braid: Cheesy beef and all the fixin’s baked in a golden braid and ready in 30 MINUTES! 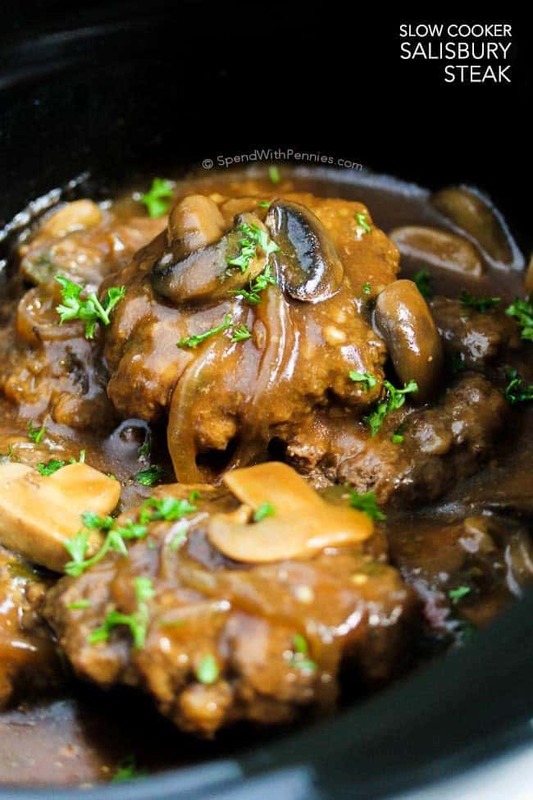 Salisbury Steak Burgers: Tender juicy beef patties, topped with a rich mushroom gravy sandwiched between a sesame bun! I hope you love this pie if you try it Bee! Made this last night and all three kids loved it! Thanks for sharing. I didn’t have enough BBQ sauce so subbed in steak sauce. Also added some American cheese slices for extra melty goodness. Will definitely make again. Pssst! Ignore my previous question if you wish. Just read Linda’s comment where she increased the ketchup and skipped the bbq sauce! This looks like something fun to fix for my monthly book club pot luck. Will it matter if I skip the BBQ sauce? That is something I seldom use. Kind of hate to buy the jar for 3 tablespoons. Save a packet next time you go thru the drive thru! I just wanted to tell you that I LOVE THIS RECIPE! It is on repeat in our home. All of us love it, it is super simple and quick to prepare, and tastes delicious! Diced dill pickles are a great topping. Thank you! I look forward to trying your other recipes. I haven’t tried it Brandy. You may want to bake it longer and only uncover the crust for the last 15 minutes. Let us know how it works if you double it. I’ve used deep dish crusts and tripled the recipe – it works perfectly. Same cooking time – everything is already cooked so all you’re really doing is cooking the crust and melting the cheese. So glad you loved it Cindy! WOW!!! AMAZING recipe & since it’s just me & my foodie hubby, there were leftovers for a few days!! It reheats VERY WELL!!! Some dishes actually reheat better than the original, because the flavors have more time to mix… THIS IS DEF ONE!!! It’s awesome right out of the oven, but it gets better with age!! YAY!! I’m so glad you and your hubby loved this April! Thank you for sharing your tips! I have made this several times now and my family (4 boys) love it! I followed the recipe exactly the first time but personally food it kind of sweet. Since then I have made it by increasing the ketchup and leaving out the barbecue sauce. Glad your family love it Linda! Just made this tonight and we all loved it, even my other half who is not a fan of burgers. Just made this tonight and we all loved it. Even my other half who is not a fan of cheese burgers. I made this recipe the other day for dinner me and my family loved it, tasted so delicious. I used turkey meat instead it came out so good. I’m so glad they loved it. My family loved this! I used sliced potatoes on the bottom in place of the pie crust. My husband said it was cheeseburger and fries :) Very good! That sounds like a delicious idea Kris! This was tasty, but I found that there was too much filling for the pie crust (I bought tenderflake). I would have had enough for two pies. I did add pickles because I’ve ha bacon cheeseburger pizza with them and it was amazing. Overall a tasty, quick weeknight recipe. So glad you enjoyed it Chantal! Pickles sounds like a great addition! I had fun making the pie. My family loved it and today I’m going to try mini pies in my muffin pan. I added pickles to the recipe, yum! I am anxious to try this. However, the photo looks like there are pickles in it. Pickles are not one of the ingredients listed. Since I always get extra pickles, I know they would be good either baked in the pie or chopped and scattered on top after it it baked. There are no pickles in the photo, they might be onions that you’re seeing. Either way, pickles would be awesome in this recipe! I’ve made this a few times now, according to the recipe. The only thing I recommend is par bake the crust first, or bake lower and slower as it’s really easy to get a soggy bottom on this pie. We licked the platter clean. Thanks for the great recipe. I made this pie for dinner tonight and it was a hit! Followed the recipe precisely except I did use a deep dish pie crust. All of the ingredients happened to fit perfectly. It was so delicious my 1 year old ate almost a whole slice to himself! Will definitely make again and again! I am so glad your family enjoyed this recipe, Stacie! Hi, your picture looks like your pie has pickle in it? But there is no mentiom of pickle in you recipe? Holly the picture looks like it has little pieces of pickle chopped in. Did you add pickle? I think I might. This looks great. Yes you can add the pickles on! Totally optional! This is what’s for dinner tonight. It’s ready to go in the oven now. I have a picky eater and more enduring if the barbecue sauce or any of the spices are really strong tasting. Also if I wanted to make the filling in advance, would you store it in a separate container or do you think I could add it to the piecrust? It might make it to soggy…Thanks, it looks great! I think I would store it separately to ensure the pie crust stays nice and crisp. Was a little dry could you add an egg to the meat/ bacon mixture? I haven’t tried adding an egg to the mixture. If you are finding it dry you might like to add some extra sauce or even chopped mushrooms which have moisture. I’m making this tomorrow night. I was wondering if I put pickles in it how much and what kind?? Dill or what? I would use about 1/3 cup chopped dill pickles (personal preference). My boyfriend is wanting me to make this for dinner, but I’m in need of suggestions for what to serve with it? Thanks! We like to serve a nice fresh salad with this. If you’re looking for a starch, homemade oven fries or roasted potatoes are a good choice. You are a great person and I hope that I can make the bacon cheeseburger pie as great as you can. Thank you Dorrine! I hope you enjoy it! I just wasn’t crazy about the flavor! I guess if I tried again I would def not put mustard or bar b que sauce!! But thanks for sharing. I like trying new things!! Add some green chile or jalapeños for a little extra zip. This is a very good recipe….the first time I made it i use half cheddar and half mozzerella. It was very good. Now I am cooking one exact. Taste just like a bacon cheeze burger…. I used turkey and did not have to drain. Thanks and More Bacon….Thanks! You do not need to pre-bake the crust for this recipe. Enjoy!! I am going to make this tonight. I can’t help but notice it looks like pickles are in he pie yet you omitted them from the recipe. Was this in error? What. Size pie plate do I use? I used a 9″ pie plate. I plan on making this one night but making it vegetarian. I can’t wait! Sounds yummy, I must try! Yum! I think chopped pickles would be a delicious addition! This week, i was able to try out the first recipe of yours – the cheeseburger pie. Well, I changed it a bit (I always do that – it depends on what I have at home), but I can’t tell you enough about the compliments I got. Every person who tried it wanted the recipe afterwards, no kidding. I am so happy to try all the other stuff I have already saved in my “Try-out”- file. So well, thanks. You’re doing a great job. Also the pictures are delightful to watch. PS. Sorry for any mistakes I made, I am not a native… Happy cooking everyone! Why is deep dish pie crust not recommended? There is not enough filling for a deep dish crust so it would be partially empty. Made this, but added chopped pickles and finely chopped garlic…also didn’t use bbq sauce (not a fan), so I used an avocado ranch dressing instead…soooo good! Next time I think I’m going to add chopped jalapeno and make a bacon lattice! Thanks for the recipe! This is a new family favorite!! I didn’t add the bread crumbs, Tonight I am making it with a gluten free crust. So glad your family enjoyed it! This was so good!! Dad came back for 2 more servings. I added sliced mushrooms to the ground beef mixture. I had a 2lb pkg of ground beef. I doubled all but the cheese mixture. I made one pie and froze the remaining beef mixture. I will either make another pie or thought maybe making individual pies in muffin pans or mini tart pans and make the cheese mixture at that time. Thanks for sharing this recipe. I love mushrooms, I bet they were great in this!! Came across this recipe earlier today and I made it tonight. Doubled the recipe and made 2 pies since a few of our kids were going to be here. Bad thing: Realized I had already used the 2 pie crusts I thought I had in the freezer. Great thing: Realized I had already used the 2 pie crusts I thought I had in the freezer!!! 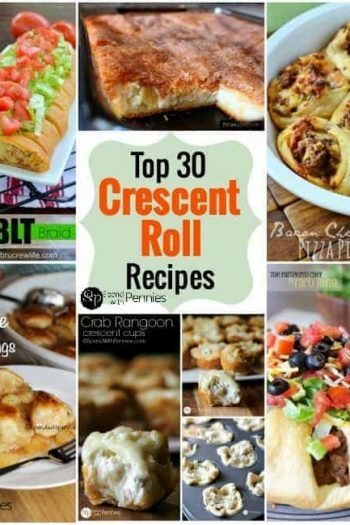 In place of them, I used one can of crescent rolls per pie and I am soooo happy I did! What a great substitute Mary! Thank you for sharing, you can’t be the only one who didn’t have pie crust handy! I’m definitely going to give that a try! http://www.chow.com/recipes/10746-basic-pie-dough. I also put the assembled pie in the frig for a couple hours and then let it sit out for ½ hour prior to baking (only because I had to go back to work)… Thank you Holly for this wonderful recipe!! Thank you for stopping by DeeDee!! So glad you enjoyed it! My husband sounded skeptical/hesitant when I told him we were making cheeseburger pie for dinner, but then he ate the rest of mine that I couldn’t finish and had seconds. This was really good. We added some jalepeno slices to the ground beef mixture and a bit of garlic powder, plus extra black pepper. It’s an excellent recipe! I’m so glad you enjoyed it! I love the idea of adding jalapeños to it! Made this tonight. Turned out great. The only changes that I would make would be to precook the bacon and to add more of the ketchup mustard and bbq sauce. The family loved it!!! Thank you!!!! It once a week/2 weeks since we found it. The only thing we do not put in is onions (I won’t touch food if it has onions in it). 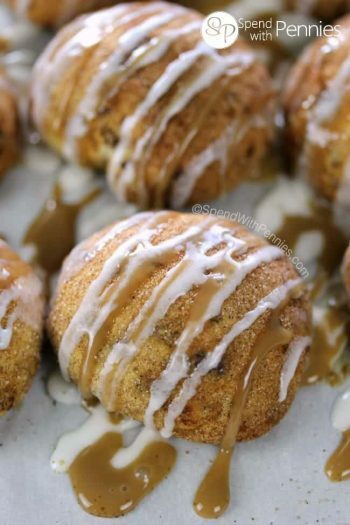 This recipe is heavenly!! I’m so glad you enjoyed this recipe Amanda!! Thanks for this recipe. I have been trying to figure out what to feed the Mr. on the weekends (Friday/Saturday). He does not like fast food and prefers that I cook. This is a great weekend meal idea and an on the go meal. I plan to make this meal this Saturday and I know he is going to LOVE it. Thanks again, and God Bless. The picture looks like it has chopped up pickles in it. was this left out or picture off? There were no pickles inside, just on the side. Just onions inside. I haven’t tried it that way but I’m sure it would work and be delicious! I’d love to hear how it works for you! do i thaw the pie crust or use frozen? If your pie crust is frozen, I would let it defrost about 10-15 minutes before filling. When you see bacon, cups of cheese, pie crust, hamburger,etc. Why would you even ask. Jeesh, I don’t think it takes a rocket scientist to figure out its not a nutricians dream recipe, but probably super tasty..lol. I’m planning to make this over the weekend. I have the Panko bread crumbs but if you didn’t what do you suggest for a substitute ? Just wondering…if I’m using a store bought frozen pie crust do I need to bake it first? Before filling and baking again? Or do I fill it and bake frozen all together? I’m a newbie to pie crusts so…better to ask than mess up dinner! Also, I’m making a variation by adding a packet of dry ranch seasoning to the beef mixture because I don’t have worscher sauce. Oops posted too soon…I don’t have BBQ sauce either so I thought the ranch would add a nice flavor. Hoping it turns out! I just need to know what to do with the frozen crust! You do not need to pre-bake the crust. :) I bet the ranch will add a great flavor! Enjoy and let us know how it works for you. The ranch mix was great! I like that you can play with this recipe to make it work for you and your tastes. I was talking to a friend and I think next we will try to modify it to be a Mexican version…black beans, corn, spices…maybe some peppers…yum! Thank you for coming back and letting us know!! Can’t wait to try it with that add it too, I think my kids will love it!! Just want to be sure I understand. There is not top pie crust – just the cheese, milk and egg combined and put on top? Looks delicious but I would have to omit a few ingredients that we don’t like – ie, mustard and onion. There is no top crust on this pie (it’s just the cheese you see on the top). And it would definitely work if you eliminated the mustard and onions. Are you able to freeze this to use for once a month cooking? I haven’t tried it but I would think you could. Tried this tonight. It was DELICIOUS!!! LOVED IT~~Definitely going into my Keeper file of favorite recipes. I even made my own pie crust for the first time and was so happy how it turned out. I LOVE all your recipes. Can’t wait to try more. Thanks for posting them. Have a great weekend Robin! I accidentally bought a deep dish crust, do you think it will work? Yes I think it should work just fine. Your crust might not be quite as ‘full’ but it should still taste great.